Desmond Pucket Makes Monster Magic by Mark Tatulli. Review: Anything can happen with a little trust, coolness, and pixie dust! Well not exactly in Desmond Pucket Makes Monster Magic by Mark Tatulli where young Desmond learns a bit of a lesson and goes through a hard time in life. From the world of scalawags and rapscallions comes a boy named Desmond Pucket, a schoolboy of Cloverfield Junior High who just loves pranks and laughs. But after one frightful and menacing prank, which takes it too far, he is at risk and discovers himself in trouble and potentially not going to his 6th grade field trip to Crab Shell Pier. This is a horrible fate for Desmond, because this is where he DREAMS of riding Mountain Full of Monsters. Can he clean up his act while staying true to himself? You'll just have to find out in the rib-tickling book Desmond Pucket Makes Monster Magic. 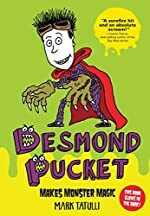 Desmond Pucket Makes Monster Magic is hilarious and intended for elementary students. One great attribute of the book is that it exemplifies Diary of a Wimpy Kid by Jeff Kinney, which you know every kid adores because of the humor. Also Desmond Pucket Makes Monster Magic is really amusing because of the jokes, humorous illustrations, and funny pranks that play out while you read. For example, at one part, Desmond's mom comes and then all of a sudden an alien head pops out of his shirt! Another reason why Desmond Pucket in Monster Magic is a great story is that some kids may relate to the troublemaking of the main character and his friend. Readers quickly learn that two wrongs don't make a right. They also learn that it's important control yourself. One final great ingredient of the book is that it has a good vocabulary for elementary readers. Most words will be familiar, but there may be a few challenging ones that help them learn new words. In conclusion, I recommend the great book Desmond Pucket Makes Monster Magic! We would like to thank Media Masters Publicity for providing a copy of Desmond Pucket Makes Monster Magic for this review. Have you read Desmond Pucket Makes Monster Magic? How would you rate it?